When you hear the name “endive” you most likely think of a pale, leafy vegetable called “Belgian endive” that is often found stuffed and served as an hors d’oeuvre. In actuality, Belgian endive is not a true endive, but in fact, part of the common chicory family (along with radicchio and puntarelle). Confusion may exist because chicory and endive are both part of the chicory genus, a grouping of several other bitter-leafed vegetables. As for true endives, two varieties are commonly grown: frisée and escarole. Frisée, also known as “curly endive,” has frilly leaves and is often found in salad mixes. 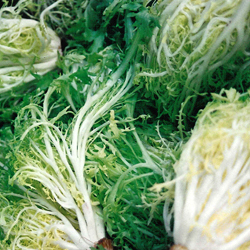 Escarole has broad, sturdy, pale yellow to light green leaves that are both bitter and sweet. It makes a great addition to soups or salads. Both greens can be sautéed, grilled, or eaten raw.